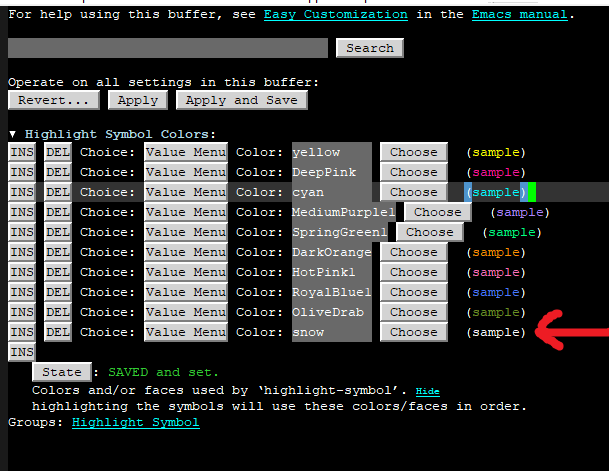 As you can see the variable highlight-symbol-colors contains all 10 colors, including "snow". How to make option highlight-symbol-colors contain ONLY the colors I add, and not also the colors that it has by default? So as result I must use 10 colors. Of course. In Customize, just click DEL for each of the colors that you do not want to include. INS inserts a color value. DEL deletes a color value. Your comment suggests that you want to use a function in your init file that takes only "snow" as argument and adds it to the value of highlight-symbol-colors. If not, it is really not clear what you are asking. "Add COLOR to the value of `highlight-symbol-colors`." Then put this in your init file: (foo "snow").